Unlike the TPLO, the bone cut is outside of the joint. There is less articular cartilage damage over time. There are excellent short and long-term functional results. There is rapid healing compared to other CCL procedures (6 to 7 weeks vs. several months of healing time). There is excellent passive stability. It can be performed on a juvenile patient because the surgery doesn’t involve the growth plate. We want your beloved pet to be able to return to the things he/she loves to do as soon as possible and the CBLO is truly the best option in most cases. Interested? Dr. Adams provides a no-cost second-opinion consultation on knee injuries to discuss your options. Just ask us when you schedule so we can request records and X-ray images to review prior to your appointment. The cranial cruciate ligament (CCL) is one of the main stabilizing structures in the canine or feline stifle (knee) joint. Its role is to help maintain a normal relationship between the femur (thigh bone) and tibia (shin bone) in all angles of motion. More specifically, the CCL prevents the tibia from sliding forward, relative to the femur. The cranial cruciate ligament also prevents excessive internal rotation of the tibia and plays a role in limiting hyperextension of the stifle. Rupture of the cranial cruciate ligament (CCL) in the knees (stifles) of dogs is common. It is the equivalent of a person “blowing out their knee” when they tear their ACL (anterior cruciate ligament). In people it is often related to significant trauma. 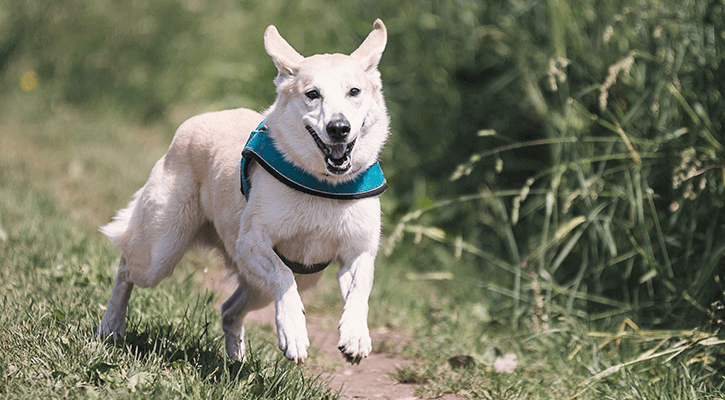 In dogs it is thought to be a degenerative condition of the soft tissue with the slope of the tibial plateau exacerbating the problem; if the slope is excessive, the femur slides back off the tibia during extension putting significant strain on the CCL. When the CCL ruptures or tears, the stifle becomes unstable and the normal relationship between the femur and tibia is altered leading to inflammation (arthritis) and pain. If the instability is not treated, lameness frequently persists and arthritis will progress. Because of the instability in the stifle caused by the ruptured cranial cruciate ligament, the medial meniscus can be pinched between the femur and the tibia causing irreparable damage. Subjectively, it appears that patients with CCL ruptures and meniscal damage are more painful (i.e. more lame) than patients without meniscal damage. There have been many surgical procedures used to treat the problem over the years. The TPLO (tibial plateau leveling osteotomy) was developed ~30 years ago to correct the anatomic problem that predisposes to cruciate rupture by reducing the tibial plateau angle. The theory behind TPLO is that by rotating the slope of the joint surface at the top of the tibia, the forces that are normally counteracted by the cranial cruciate ligament will be reduced or eliminated. It is a method that works, but since it does not stabilize the back-and-forth motion of the femur on the tibial plateau, long-term follow-up studies have shown a breakdown of the joint cartilage. CBLO was developed as a refinement of the concepts of TPLO and addresses some of the issues that could cause complications with TPLO. One of the issues with TPLO is that in a lot of dogs the end result is that the load bearing axis of the tibia is moved further away from the anatomical axis of the tibia. CBLO addresses this by inverting the rotation which results in the weight bearing axis being brought into alignment with the anatomical axis. The photo above shows the classic curved cut and plate of a TPLO. You can easily see the “balcony effect” whereby the downward force from the femur is moved behind the tibia and not down the center of the bone where it should be. The red lines in the photos below show the rearward slant of the tibial plateau before and after CBLO surgery. The goal is to reduce the angle to about 10 degrees, not completely eliminate it. The curved cut in the bone (osteotomy) is clearly seen in the second photo, as are the screws and plate used to stabilize the osteotomy. The weight-bearing axis has been shifted behind the tibia. In this x-ray image, the femur can be seen to have slipped rearward off the tibial plateau because the cranial cruciate ligament is ruptured. This is the positive cranial drawer sign. The post-CBLO x-ray on the right image shows the femur back in the appropriate weight-bearing position on the tibial plateau. Rehabilitation following the CBLO can begin as soon as the pet goes home. The area can be chilled with a padded ice pack for 10 minutes a couple times daily. (Do not try to make up for a skipped treatment by icing the area longer; prolonged cold exposure can cause injury.) Passive range of motion exercise where the knee is gently flexed and extended can also help. It is important not to induce pain when moving the limb. Let the patient guide you. Avoid twisting the leg. After the stitches or staples are out (or after the skin has healed in about 10-14 days), water treadmill exercise can be used if a facility is available. Walking uphill or on stairs is helpful for strengthening the back legs but no running, jumping or other “explosive” type exercise should be performed for a full two months after surgery. A dog with arthritis pain from an old cruciate rupture may still benefit from a surgical repair. It may be worth having a surgery specialist take a look at the knee. Most cases must make do with medical management. Visit this site for information on arthritis treatment. We mentioned the meniscus as part of the knee joint. The bones of all joints are capped with cartilage so as provide a slippery surface where the bones contact each other (if the bones contact each other without cartilage, they grind each other down). In addition to these cartilage caps, the stifle joint has two “blocks” of cartilage in-between the bones. These blocks are called the menisci and serve to distribute approximately 65% of the compressive load delivered to the knee. The only other joint with a meniscus is the jaw (tempero-mandibular joint). When the cruciate ligament ruptures, the medial (on the inner side of the knee) meniscus frequently tears and must either be removed, partly removed, or – ideally – repaired. This is generally done at the time of cruciate ligament surgery and we would be remiss not to mention it.